Autogeek is proud to carry the Menzerna Polishing Compounds product line of car care products imported from Germany. Menzerna polishes are the same polishes used by Mercedes Benz of Germany. 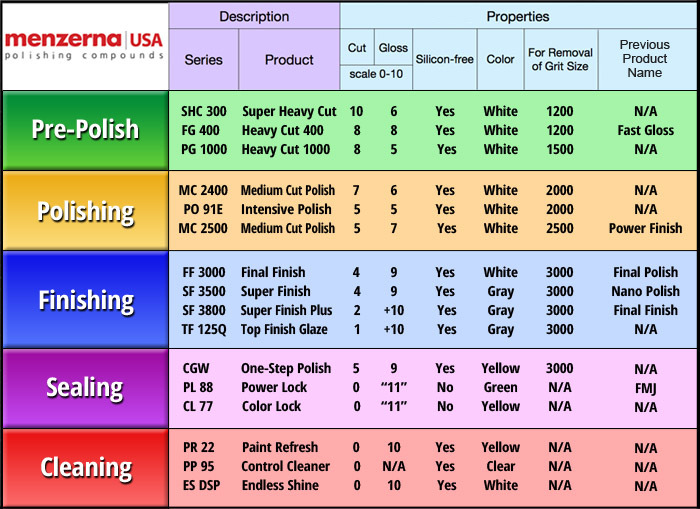 Looking for Menzerna Color Lock Carnauba Wax, Menzerna Power Lock Polymer Paint Sealant, Menzerna Top Finish Machine Glaze, or Menzerna Paint Refresh Professional Grade Detail Spray? Those products have been re-branded and can be found under the Jescar Finishing Products Page! Scroll down to shop Jescar Finishing Products now! Menzerna One-Step Polish 3-in-1 32 oz. Menzerna Super Heavy Cut Compound 300 8 oz. Menzerna Medium Cut Polish 2400 32 oz. Menzerna Medium Cut Polish 2400 128 oz. Menzerna Super Finish (SF-3500) 32 oz. Menzerna Super Heavy Cut Compound 300 32 oz. Menzerna Super Heavy Cut Compound 300 128 oz. Menzerna Heavy Cut Compound 400 (FG-400) 128 oz. Menzerna Final Finish (FF 3000) 32 oz. Menzerna Final Polish (FF 3000) PO 85U 128 oz. Menzerna Medium Cut Polish 2500 8 oz. Menzerna Medium Cut Polish 2500 32 oz. Menzerna Rupes LHR 21ES Maximum Shine Kit FREE BONUS FREE SHIPPING!